Hey there! Happy New Year! Nope, this isn’t a sponsored post, but I did want to drop in and say that I am totally loving the time that Mr. Houseful and I have been able to carve out for ourselves lately. When I dropped the idea (for US) that we had to have a planned date, things just started falling into place. 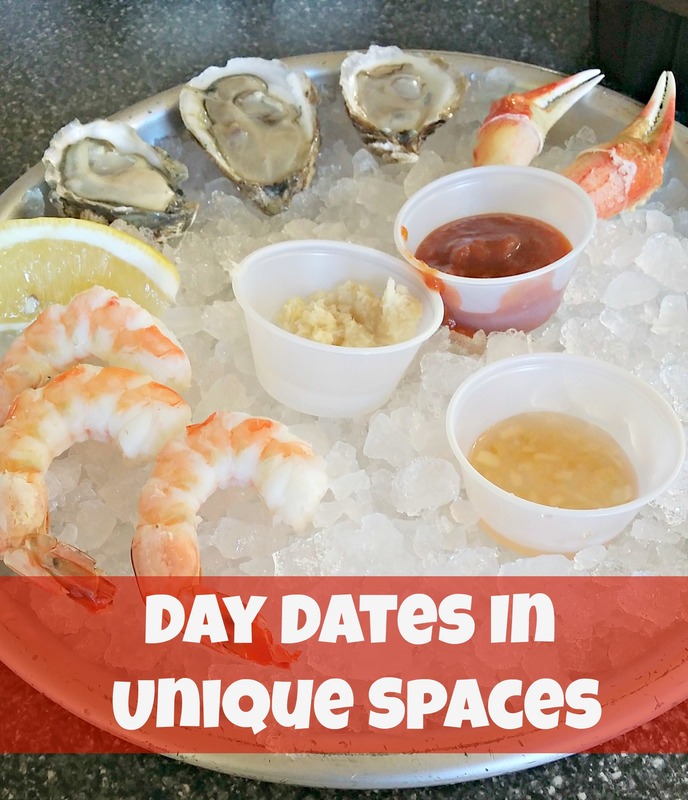 And, get this, it turned out to be one of the most frugal dates we had been on to date! Like this impromptu date at Mariano’s Market here in Chicago. I mean, we had to grocery shopping anyway, why not make it a little bit romantic? The kids were with my in-laws and we were finished doing what we had to do for that morning (which I can NOT wait to tell you all about) anyway, so we decided to stop for lunch too. In the car, we debated if we wanted to stop at McDonald’s or some other drive through joint, and I said no, and stated let’s just go to the grocery store and get it over with. We walked in to a store that was super busy, but not packed, and signs all over the place announcing $10 lunch specials until THREE because they’re smart. As usual there was always the hot food table, the salad bar, the ability to buy a STEAK and get it grilled to your liking, and the sushi, oyster and wine bars to round out your meals nicely. My meal is above, for $10 I was able to snag three fresh oysters, three chilled HUGE shrimp, and two crab claws from the oyster bar. The cellist and I have also eaten here, and the particular man who serves us each time is SO nice. For $6.29 a pound, Mr. Houseful visited the hot bar, and got all of this. 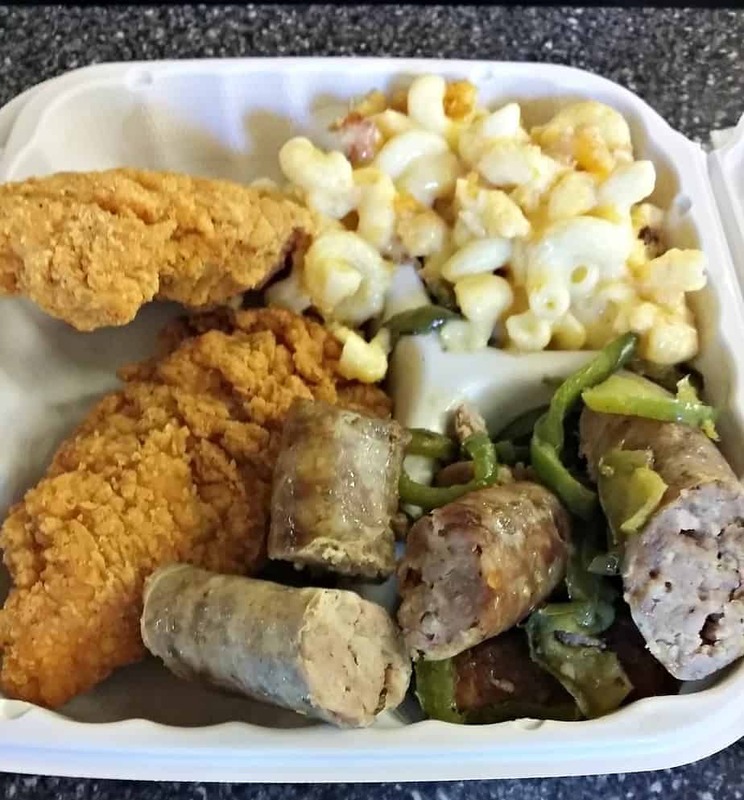 Chicken fingers that were massive, italian sausages with a pepper mix and mac n’ cheese. The mac n cheese was super cheesy, savory and perfection to me. It even encouraged us to add mac n cheese to our grocery list. That’s how grocery stores do it right. Appeasing to a couples desire to have frugal dates and quality time, on top of offering a great grocery store experience, is just one of the reasons that places like this are doing so well. I’m loyal to grocery stores for certain things. If I want fresh fruits and veggies I would visit a store, fresh meat that was reasonably priced, I would visit another, deli foods, I would visit yet ANOTHER, and of course if I wanted organic, or whimsical items I would visit yet one more. For all of my other items I would visit Dominick’s which closed down at the end of last year, and my trips would be complete. I do feel that quite honestly, I can get all of that whenever I visit Mariano’s. It has now moved to my main grocery store where I can at least get everything listed in one trip. Will I visit others, yes, but I do feel that I have found a place to limit the amount of running around that I do. Plus, the fact that I can sit down in the middle of the normal hustle and bustle of a Saturday and have a great conversation with my husband over good food makes it all worth it. I see us spending several afternoons after running errands picking up food from here, and catching up with each other since it seems virtually impossible to do while we are both in the house. So, are you looking to spend more quality time with your husband, wife or significant other this year? Look at places off the beaten path. Seriously, grocery stores, BOWLING alleys (check out this post on Pinstripes and THEIR food!) and even movie theaters. Don’t think that great dates have to take big dollar amounts. Be spontaneous. Planning of dates doesn’t ALWAYS have to be done. I know that some of you all cringe when I say that, but if you open up to spontaneity, you’ll be surprised how much fun you have. DO NOT TAKE YOUR CHILDREN! And for those of you who say things like I can’t trust anyone to take care of my kids, or they’re all too small, then order take out, get a babysitter and lock yourself in a room away from the kids. Hey, hole up in the car in FRONT of the house if you have to, just get into an area where it’s just you and your love. TURN OFF CELL PHONES. Enough said. With all of that being said, go grab your honey and carve out some time for them tomorrow. You’ll be glad that you did! Get in the car, grab a couple slices of pizza, go through the carwash and sing an oldie but a goodie….at the top of your lungs and enjoy the laughter and dialogue that comes next!